What began over twenty years ago as a dream of bringing together fresh, handcrafted beer and made-from-scratch, world class cuisine – is today a reality at Gordon Biersch Brewery Restaurants from coast to coast and across the Pacific to Hawaii and Taiwan.This dream of exceptional beer and delicious food became a reality on July 6, 1988 when the first Gordon Biersch opened in Palo Alto, California. Acquired by Big River Brewing Company in 1999, Gordon Biersch currently operates 33 restaurants in the United States, including Honolulu, Hawaii. Additionally, three Gordon Biersch Brewery Restaurants operate in Taiwan. The Gordon Biersch heritage of superior beer, great food and good times are now being served up fresh daily. Passport Rewards includes some of the expected in-restaurant reward options, but the program also includes the big-ticket reward options that are “aspirational.” A good way to keep big spenders engaged in the program – give them rewards to save for. 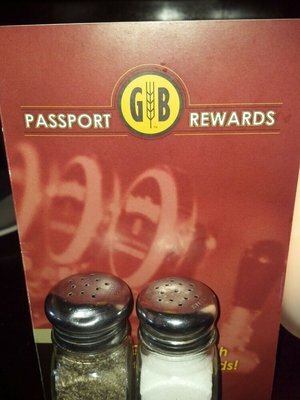 The Passport Rewards Program offers you even more ways to enjoy the Gordon Biersch experience. For every $1 you spend, you earn 1 Passport Point. Earn enough points and you can redeem them for rewards and prizes! The points you earn can be redeemed at anytime for rewards such as Gordon Biersch gift cards, brewer’s dinners, or a variety of fantasy vacations! Stored Value Rewards are not valid for tax or gratuity and may not be combined with any other offer, discount, or prix fix meal. Stored Value Rewards are not available for cash or points if full value is not used. If a portion of the meal is paid for with a discount, gift certificate, or promotional gift card, Passport Points cannot be accrued for that portion of the check. * Enjoy a $300 gift certificate from L.L.Bean. Enjoy an all inclusive dinner package for up to ten people. Special entrees are prepared with our fresh brews and then perfectly paired to complement each course. Complimentary Brewery Tour is provided. *Event based upon restaurant availability. High volume nights (Thursday – Saturday) are blacked out unless approved by the restaurant’s General Manager. Room and taxes are covered by GBBRG. All incidentals are sole responsibility of member. Accommodations determined by GBBRG based on availability. Double occupancy. All travel arrangements must be arranged 8-10 weeks prior to event. Entertainment Tickets are based on availability. Pre-determined selections may apply. *Event based upon restaurant availability. High volume nights (Thursday – Saturday) are blacked out unless approved by the General Manager. Room and taxes are covered by GBBRG. All incidentals are sole responsibility of member. Accommodations determined by GBBRG based on availability. Double occupancy based on Availability. All GBBRG Gift Card Rewards expire within one year from date of issuance. Gift Card Rewards are not valid for tax or gratuity and may not be combined with any other offer, discount, or prix fix meal. Gift Card Rewards are not available for cash or points if full value is not used. All travel arrangements must be arranged 3 months prior to event. Room and taxes are covered by GBBRG. All incidentals are sole responsibility of member. Accommodations determined by GBBRG based on availability. Double occupancy based on availability. All travel arrangements must be arranged 8-10 weeks prior to event. Room and taxes are covered by GBBRG. All incidentals are sole responsibility of member. Accommodations determined by GBBRG based on availability. Double occupancy based on availability. All travel arrangements must be arranged 8-10 months prior to event.